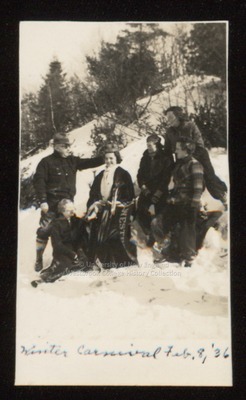 Five Westbrook Junior College students stand and sit in the snow while one of their party is crowned Winter Carnival Queen in this sepia toned candid snapshot labeled Winter Carnival, Feb 8, '36 on the front. On the back is written in blue ink and small handwriting: D.P., Anna Horne, Marie Hermaine, Harriet Cook, Audrey White, Barbara Cole. Dr. Proctor, wearing dark glasses, a felt hat and boots, places the Winter Carnival Queen's crown on Marie Hermaine's head with his left hand. Miss Hermaine wears a long "velvet' robe and her court wears ski attire.